Eamon Ore-Giron (b. 1973, Tucson, USA) blends a wide-range of visual styles and influences in his brightly colored abstract geometric paintings realized on raw linen and canvas. The artist grew up in the Southwestern United States and has spent significant time in Spain; Peru, where his father is from; and Mexico, where he is currently based. Ore-Giron’s travels, personal biography, and his formal education as a fine artist—he received an MFA from the University of California, Los Angeles—have shaped his artistic vocabulary, which references Native American medicine wheels, Amazonian tapestries, the Mexican muralists, Russian Suprematism, and Latin American Concrete Art, as well as hard-edged abstraction and European modernism. Ore-Giron also works in video and music, as part of collaborative endeavors and as a musician and DJ. He is keenly aware of the history and cross-cultural evolution of musical styles. In a similar vein, his work makes manifest a history of transnational exchange that has informed painting. He has said that his work “originates from a certain nostalgia for a global modernism” and the notion of a universal visual language. 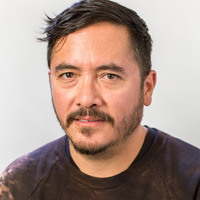 With his expansive approach, which marries Latin American aesthetics and indigenous craft and folk traditions with 20th century avant-garde, Ore-Giron creates a unique artistic language that feels at once timeless and contemporary and resonates across cultural contexts. The speaker series provides a context to explore a ‘kaleidoscopic’ range of interdisciplinary and intersecting experiences in the art world. Drawn primarily from Los Angeles arts professionals, the speaker series features presentations and workshops by a spectrum of emerging and veteran practitioners, as well as, recent alumni from LMU’s art and art history program. The series is free and open to the university and the public.